, son of lord Charles Cavendish (who was brother to the third duke of Devonshire), | and the lady Anne Grey, third daughter of Henry duke of Kent, was born at Nice, whither his mother had gone for her health, on Oct. 10, 1731, and after an education befitting his rank, partly at Newcombe’s school at Hackney, and partly at Cambridge, devoted his life to scientific pursuits, and became one of the most eminent chemists and natural philosophers of the age. He had studied and rendered himself particularly conversant with every part of sir Isaac Newton’s philosophy, the principles of which he applied near forty years ago to an investigation of the Jaws on which the phenomena of electricity depend. 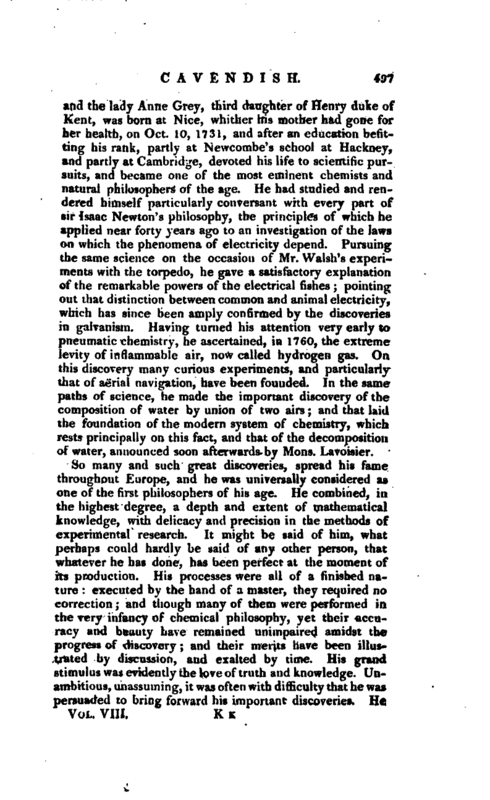 Pursuing the same science on the occasion of Mr. Walsh’s experiments with the torpedo, he gave a satisfactory explanation of’the remarkable powers of the electrical fishes; pointing out that distinction between common and animal electricity, which has since been amply confirmed by the discoveries in galvanism. 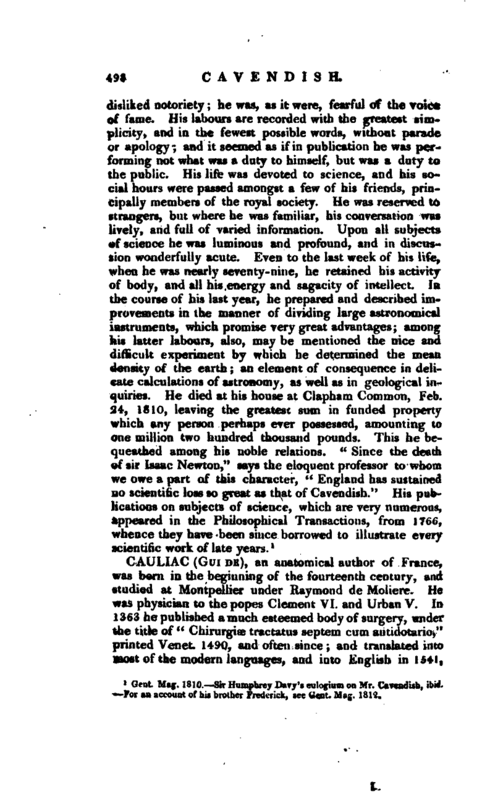 Having turned his attention very early to pneumatic chemistry, he ascertained, in 1760y the extreme levity of in flammable air, now called hydrogen gas. On this discovery many curious experiments, and particularly that of aerial navigation, have been founded. In the same paths of science, he made the important discovery of the composition of water by union of two airs; and that laid the foundation of the modern system of chemistry, which rests principally on this fact, and that of the decomposition of water, announced soon afterwards by Mons. Lavoisier. Gent. Mag. 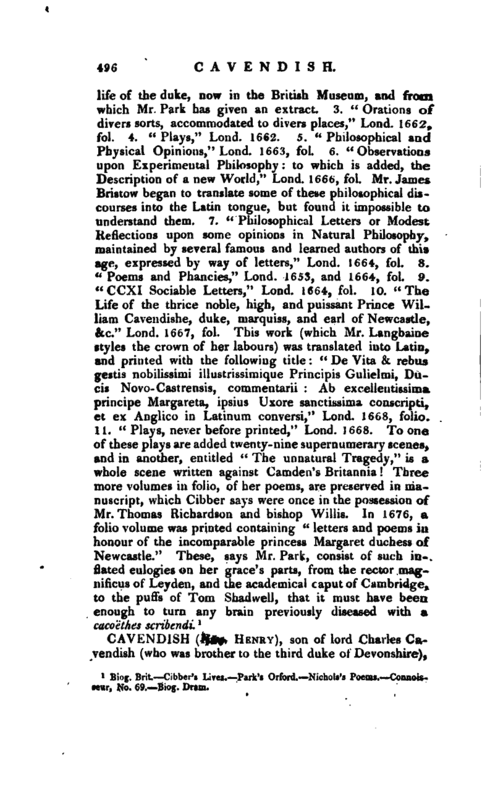 1810.—Sir Humphrey Davy’s eulogium on Mr. Cavendish, ibid. —For an account of his brother Frederick, see Gent Mag. 1812.